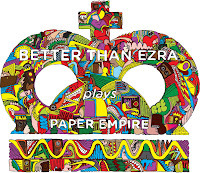 Better Than Ezra, Kevin Griffin (vocals, guitar), Tom Drummond (bass) and Michael Jerome (drums) released their new album Paper Empire this past Tuesday. For those in the New York area, Better Than Ezra are on the road and will be at Irving Plaza on June 19. Watch the video for "Absolutely Still" below and download the single HERE.